A great boost for your immune system while also being gentle, NOW Foods Sustained Release C-1000 with Rose Hips provides a potent dosage of this key vitamin in a “time-released” format that provides Vitamin C to the body over a longer period of time (2 hours). It is blended with Rose Hips, a natural source of Vitamin C and a synergist. Use of Rose Hips avoids the common allergen of citrus. Most time released Vitamin C products add citrus bioflavonoids, which could result in undesirable allergic reactions. 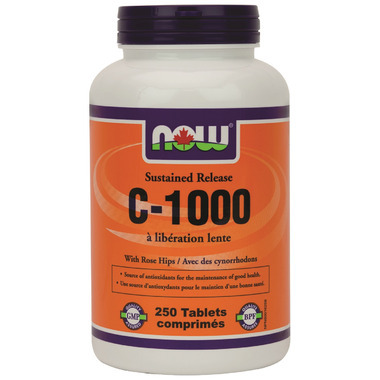 NOW's Sustained Release C1000 is superior and different from the other time-released versions in the market today. Non-Medicinal Ingredients: Cellulose, Hydroxypropyl Methylcellulose (vegetable source), Magnesium Stearate (vegetable source), Tablet Coating (vegetable source). Directions: Adult Dosage: Take 1 tablet daily, preferably with meals. This product is designed to gradually release over a 2-hour period. Cautions: Do not use if you are pregnant or breastfeeding.